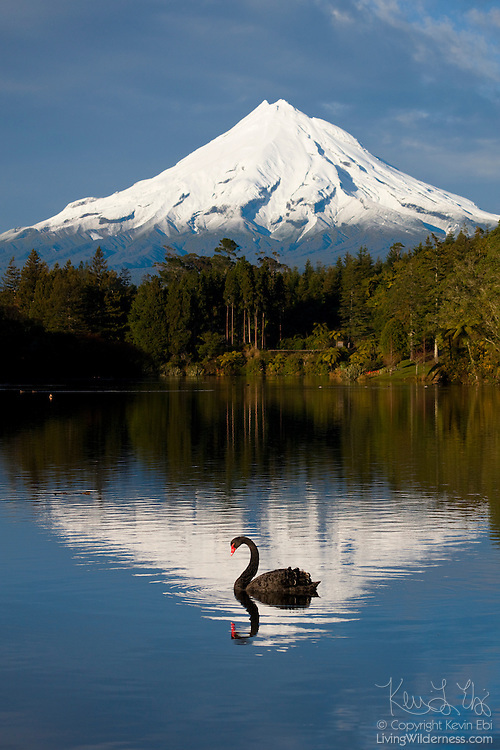 A black swan (Cygnus atratus) swims across New Zealand's Lake Mangamahoe with Taranaki (Mount Egmont) in the background. While black swans were brought from Australia to New Zealand in the 1860s, there's some debate as to whether the species should be considered introduced. Black swan populations grew rapidly, suggesting the many of the birds may have found their own way to the country. The black swan is New Zealand's largest wetland bird.